This three stage external oil pump is configured for left hand mounting (referenced from driver’s seat position) and can be used in any external pump application. 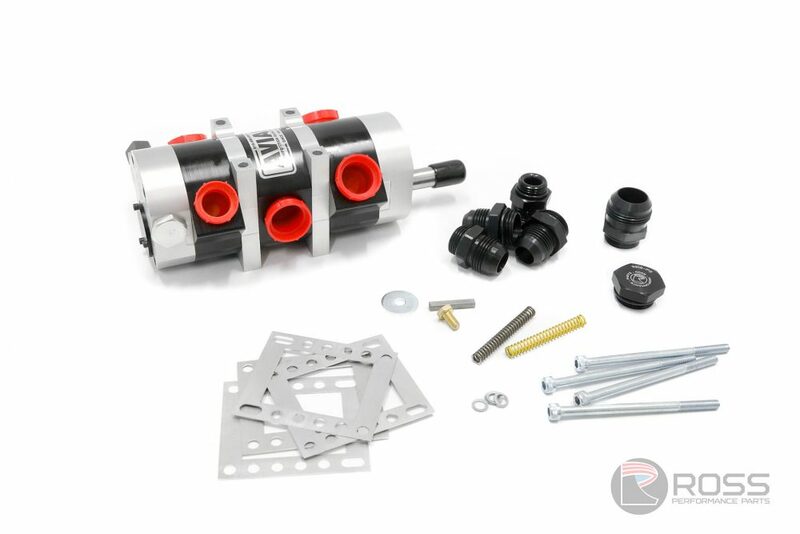 The flat face 6 bolt mounting system suits Ross Performance Parts oil pump brackets, with belt tensioning achieved by the use of the included shim pack. This is a far more rigid and consistent belt tensioning system than other brand pumps. Ross Performance Parts prides itself on superior in-house design and precision manufactured components and have sourced a high quality solution to complement our product range. These high quality pumps are manufactured in the USA and are available in multiple configurations. Ross Performance Parts stock common 1, 2, 3, 4 and 5 stage pumps with stage sizes and pressure relief springs pre-installed to suit most applications. Ross Performance Parts are able to supply mounting brackets, AN fittings and plugs, HTD toothed belts, pulleys and shields to suit your install. Please contact us for special pump configurations to suit your application.